Thru the Lens competition will have two categories. There will be a category for middle school through high school students and a separate category for all ages. The winners will be announced in May and one of the top prizes is the opportunity to make your film from your screenplay and see it up on the silver screen at the Del Oro Theatre’s Red Carpet Gala in October. The deadline for Thru the Lens 2018 has been extended to Friday, April 6. There is still time for creative and inspired Nevada County residents to capture their muse and write a screenplay for this amazing fundraiser for Nevada County Television. Thru the Lens has two categories. There is a “5 Minute Flick” category for middle school through high school and a “General” category for all ages. The “General” category is a 10-page/10-minute screenplay; whereas “5 Minute Flicks” are only five page scripts. Winners are announced in May, and the prizes include the opportunity to make a film from your winning screenplay and see it debut on the silver screen at the Del Oro Theatre’s Red Carpet Gala in October. For complete contest rules and entry forms, visit nevadacountytv.org/thruthelens. Mark your calendars for Nevada County Television & Digital Media Center’s “Student Open House” from 6 to 8 p.m. Friday, April 12. Attendees will have a chance to explore Nevada County Digital Media Center’s state-of-the-art studio and editing suite, and meet filmmakers and creators of all ages and experience. All students (any age), teachers, and school administrators are welcome to attend. The open house takes place at 104 New Mohawk Road in Nevada City. 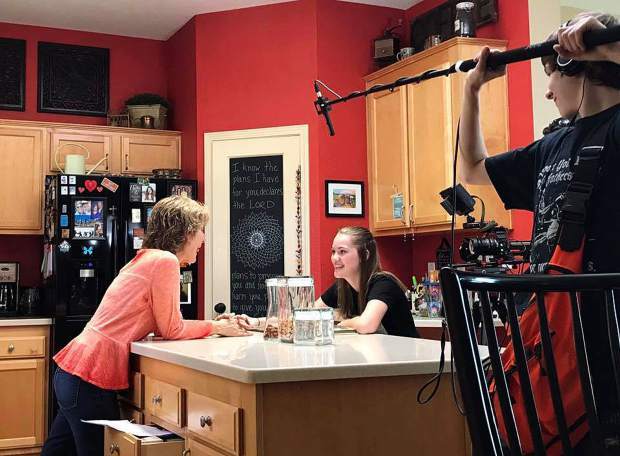 “Our Amazing Kids” now boasts a fantastic and colorful set, and filming has commenced. This is a show for kids from 5 to 18, featured on NVTV’s education channel. If you’d like to get involved in this show, contact Ramona Howard at: stationmanager@nevadacountytv.org. NCTV welcomes local programming and new members. Public access programming is seen on Comcast Channel 11 and Suddenlink Channel 16. County and city government meetings are found on Channels 17 (Comcast) and 18 (Suddenlink). Educational programming is on Comcast Channel 18. If you don’t subscribe to cable, programming can be viewed at http://www.nevadacountytv.org. If you’d like to submit your own program to NCTV, contact Executive Director Ramona Howard at: stationmanager@nevadacountytv.org. Please check our website calendar as we are adding new events every week. Our 104 New Mohawk Road studio in Nevada City is open to the public from 9 a.m. to 5 p.m., Monday through Thursday. The station is closed from noon to 1 p.m.